Do you have any favorite Naivedyam recipe? I do have and it is Balehannu Rasayan,which is a fruit salad made up of banana. 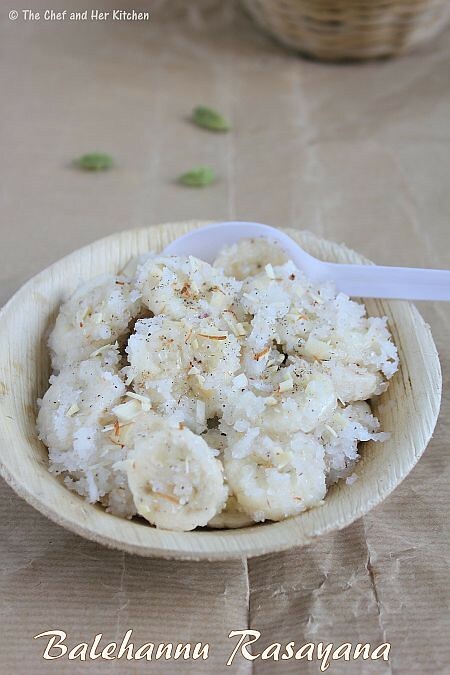 I love the Rasayana which we prepare on many festivals and also on many other occasions.It hardly takes five minutes to whip up this simple yet delicious sweet recipe.It is also a savior when you have ripen bananas which are ready to be used immediately.If you have not tried this recipe,I suggest you to try this at least once.The flavors and textures in this sweet are quite simple but tastes really nice.Some prepare this by adding milk or coconut milk,I am sharing a dry version which we make at home. 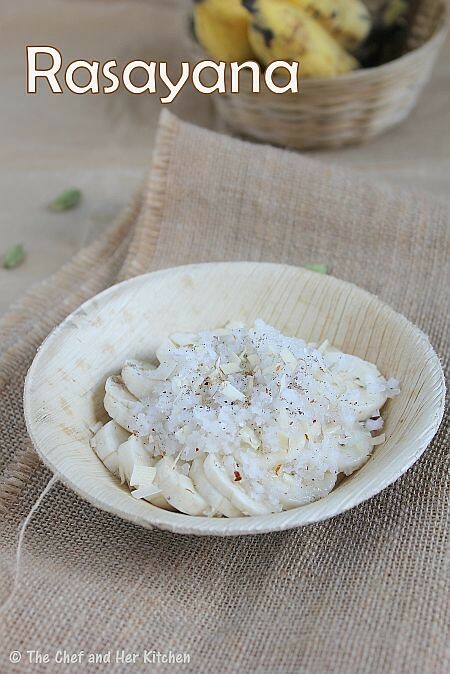 Mix grated coconut with cardamom powder,ghee and sugar powder and mix well. 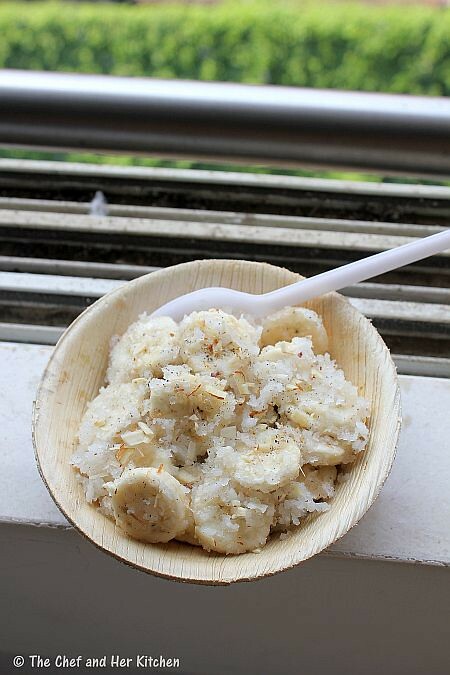 Just before serving add thin slices of banana to the mixture and give a nice mix to it and garnish with slivered almonds. Serve it immediately.If it is kept for long the bananas will turn black. 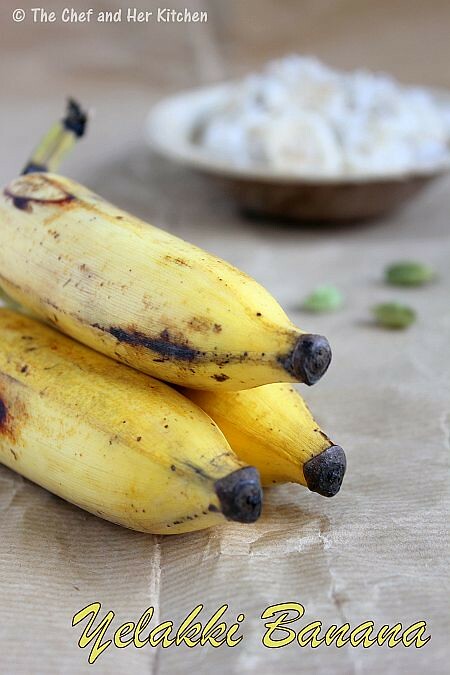 I prefer the small elaichi variety bananas in this recipe as they taste nice.But if you do not get them you can use the regular variety of bananas in the recipe. If you want you can avoid ghee in the recipe,but it enhances the taste. You can even use jaggery instead of sugar but I prefer sugar. The addition of all ingredients are just approximate,alter them according to your taste buds as there is no fixed measurement for this recipe. You can add mango to it when it is in season. Delicious and yummy looking rasayam. so easy and healthy one. 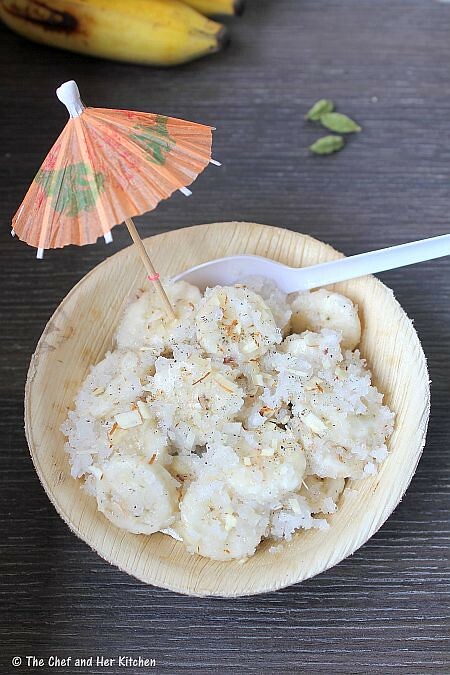 I love the elakki variety of banana.. they are so good..
wow very tempting recipe,luks YUM..
Rasayana - baayalli neeru barta ide. I use jaggery in mine.